Kor-Pak Corporation is your primary source for SEW Eurodrive products, repairs, and first-class service. As a world leader in drive technology and a pioneer in drive-based automation, SEW Eurodrive has established a reputation for quickly solving the most difficult power transmission and motion control challenges. We introduced the gearmotor in 1931. In the 80 years since then, we have been bringing the best in drive technology to our customers. 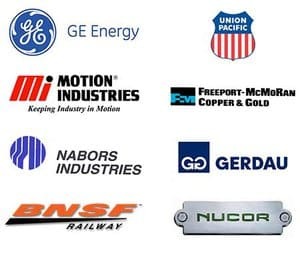 That commitment has led to a history of innovations — the first variable speed gearmotor, early development of electronic drives, some of the first successful efforts to decentralize control, and the first motor with energy-efficient copper rotors. Combining VARIBLOC®® and VARIMOT®® variable speed gear units with all types of reduction gear units within the SEW‑EURODRIVE modular concept creates variable speed drives with a low output speed and high output torque. Combining variable speed gearmotors with helical, parallel-shaft helical, helical-bevel and helical-worm gear units has proven effective at low speeds. Variable-speed gear units are available with DRS.. and DRE.. motors. This means they meet the European requirements on efficiency levels and nearly all international efficiency levels. The foot- and flange-mounted versions can also be used to power machines without a reduction gear unit. Speed can be adjusted mechanically, e.g. with a handwheel, or electromechanically using a servomotor. The modular DR.. motor series includes the 3 types of energy efficient motors (IE1, IE2 and IE3) along with the perfect brake concept – up to 3 different brake sizes per motor size – as well as cost-optimized built-in encoders integrated in the motor. The DR.. motors comply with all worldwide standards and already fulfill the new parts of the IEC motors standard. The DRS.. motor in the modular DR.. series motor system is a motor that meets the standard efficiency level. 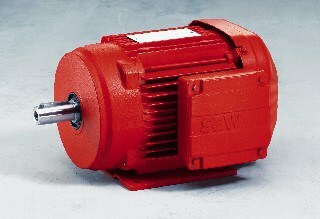 The motors are marked with IE1 according to IEC60034-30-1. 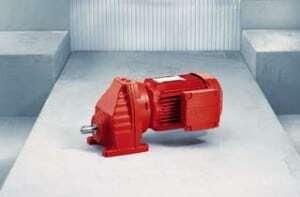 The DRE.. motor in the modular DR.. series motor system is a motor that meets high efficiency requirements. The motors are marked with IE2 according to IEC60034-30-1. The DRN.. motor in the modular DR.. series motor system is a motor that meets premium efficiency requirements. The motors are marked with IE3 according to IEC60034-30-1. The DRP.. motor in the modular DR.. series motor system is a motor that meets premium efficiency requirements. The motors are marked with IE3 according to IEC60034-30-1. 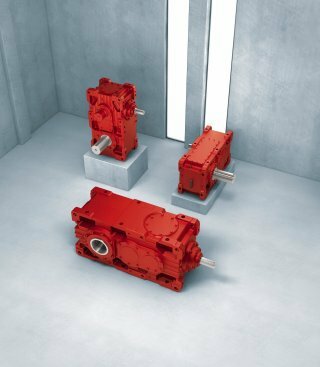 DT / DV series AC motors and AC brake motors are the ideal match for SEW-EURODRIVE vertical gear units. Our wide range of variants ensures that we have the right motor for your application, whether 2-, 4-, 6- or 8-pole or multi-speed. SEW-EURODRIVE brake motors have integrated DC safety disc brakes. The brake control is installed in the terminal box as standard, but is also available in control cabinet version as an option. The patented two-coil brake system facilitates high starting frequency and positioning accuracy with particularly short response and reaction times. MOVIMOT®, the gearmotor with an integrated frequency inverter, is a tried-and-tested combination of gearmotor and digital frequency inverter in the 0.5 to 5.4 HP power range. Despite the integrated frequency inverter, MOVIMOT® requires only slightly more installation space than standard gearmotors and can, of course, be supplied in all standard versions and mounting positions, with and without a brake, for supply voltages of 380 to 500 V and 200 to 240 V. The gearmotors have IP54 enclosure as standard, but the MOVIMOT® gearmotor is also available with IP55, IP65 and IP66 enclosures on request. This gearmotor is a heavy-duty and compact version for a number of decentralized drive solutions. SEW-EURODRIVE offers a SafetyDrive package for this application to fit plants in compliance with safety category 3 of EN 954-1. MOVIMOT® can be equipped with a BEM, BES or URM brake control system as an option in conjunction with a modular terminal box. The option is integrated in the MOVIMOT® terminal box. BEM controls the standard brake, BES controls the DC 24 V brake. URM is a voltage relay for controlling brakes. The BW100…/BW200… braking resistors in IP65 enclosure convert the MOVIMOT® drive’s regenerative energy of up to 100 W/200 W (0.134 hp / 0.268 hp) continuous power into heat. The BW150…/BW068.. braking resistors in IP66 enclosure convert the MOVIMOT® drive’s regenerative energy of up to 600 W/1200 W (0.805 hp /1.609 hp) continuous power into heat. The optional DC 24 V power supply MLU11A is mounted in one of the MOVIMOT® cable entry openings and allows for operation of one MOVIMOT® including an option with a current consumption of up to 70 mA (MBG11A, MWA21A) without an external 24 V auxiliary power supply. The optional integrated DC 24 V power supply MLU13A is mounted in the MOVIMOT® terminal box and allows for operation of one MOVIMOT® including an option with a current consumption of up to 70 mA (MBG11A, MWA21A) without an external 24V auxiliary power supply. The optional MLG..A setpoint generator is mounted in one of the cable entry openings of MOVIMOT® and offers the possibility of adjusting the input speed in the range of -100% to +100 % fmax(potentiometer f1) as well as of powering the inverter with the DC 24 V auxiliary voltage. The optional MBG11A setpoint control module has two keys and a display. MBG11A.. makes it possible to adjust the speed remotely in the range from -100% to +100% fmax (potentiometer f1). Up to 31 MOVIMOT® units can be controlled at the same time. The optional MWA21A setpoint converter converts an analog setpoint and the control signals into an RS-485 protocol. The MWA21A enables the MOVIMOT® to be controlled remotely from the control cabinet. Up to 31 MOVIMOT® units can be controlled at the same time. The DBG60B keypad can be used to control MOVIMOT® drives with integrated AS interface in manual mode. Furthermore, important information can be displayed in monitor mode. The DBG60B keypad is connected to the diagnostic interface in the MOVIMOT® terminal box. The optional MDG11A diagnostic unit indicates the operating status, output current, terminal status and MOVIMOT® fault codes when faults occur. The MNF11A integrated line filter option is mounted in the MOVIMOT® terminal box and allows for a drive system that complies with the emitted interference stipulated in EN 61800-3 as well as with the class B limit according to EN 55011 and EN 55014.